As a passionate advocate for humans with disabilities, I am SO excited to share with you a project that has allowed me to expand that passion to include animals with disabilities. I was so touched when I was contacted by Marie of Drool of Happiness about designing a t-shirt featuring her furbaby Pixie. Her blog, Drool of Happiness is a dog blog about sisters obsessed with thier unique disabled dogs in pursuit of a cruelty free lifestyle. 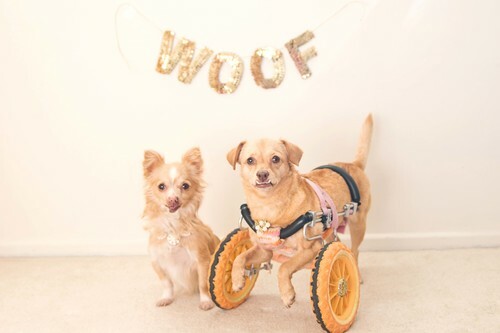 Marie and her sister, Sheena, started instagram accounts for their dogs @toothfairypixie and @underbiteunite to raise positive awareness of special needs pets. They even coined their own term for their special pups, lovingly calling them "Daisyabled." 10% of the sales from these Pixie Peony shirts will be allocated to a furry friend with special needs. Please go checkout Pixie and her amazing family! Visit their blog to learn more about their inspiring story and to order your own Pixie shirt here to help a pup in need! Since my furbaby Molly, a maltese shih tzu, is a rescue, this project was near and dear to my heart. I am so thankful that we were brought together. Pixie and Daisy certainly ended up right where they were meant to with such wonderfully caring parents that set a new bar for ultimate furbaby mammas.